A substitute teacher in our building recently approached me about some problems she was having with student behavior. She detailed how she told the kids exactly what she expected and tried to enforce the rules, but they didn't respond well at all. I got the impression she was trying the stern teacher approach. She told me about one student in particular. And as she shared, I could see her demeanor immediately shift. She was really upset. Her body language and facial expression showed she was really frustrated. I would go so far to say she was having a miserable experience. And so I felt really bad for her in that. I don't want visitors to our building to ever have a bad experience. And being a substitute is not easy on a good day. So I asked her a question, "Are you trying to enjoy the kids?" She looked at me with a puzzled expression. I'm sure she was thinking how could I enjoy these kids when they're acting out and being uncooperative? "What do you mean?" she said. "Well, I've just found that I get a much better result in working with students when I make it a point to enjoy being with them. They don't always act just like I want, but I try to enjoy them anyway." "But I'm trying to get them to follow the rules and do the work," she said. "And that's a good thing. We expect students to follow rules and be productive and use time wisely. They do need accountability for that. But how you hold them accountable can make a big difference." I encouraged her to leave some notes for the classroom teacher about the behavior problems, and asked her to give my advice a try the next time she had a chance. A couple of weeks later she was back in the building, and she came rushing up to me. Her demeanor was completely different. She was smiling and full of energy. "I tried what you said, and it worked so much better. It's like I'm not putting as much pressure on myself and the students are doing better too. I feel so relieved," she said. I told her I was so happy to hear that, and I appreciated her giving my advice a try. I thanked her for sharing with me and for giving me an update. 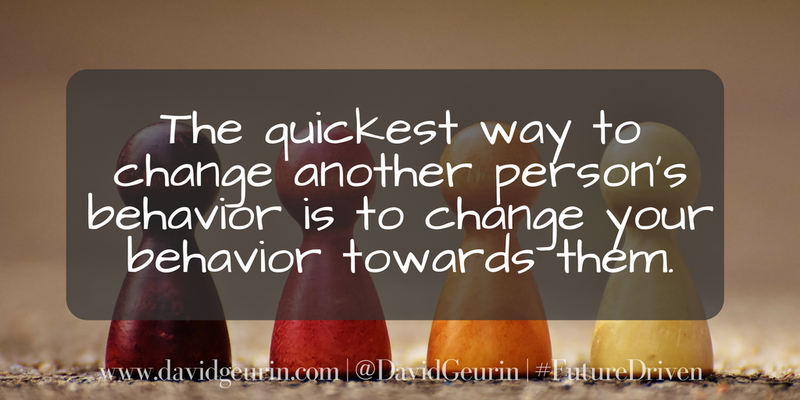 The quickest way to change another person's behavior is to change your behavior towards them. Kids are going to make mistakes. But if you make it a point to enjoy being with them, and treat them with great respect and care, there is almost no mistake you can't correct. They'll be far more open to your feedback when they feel that you like them and enjoy them. What are your thoughts on this advice? Are you enjoying the kids? 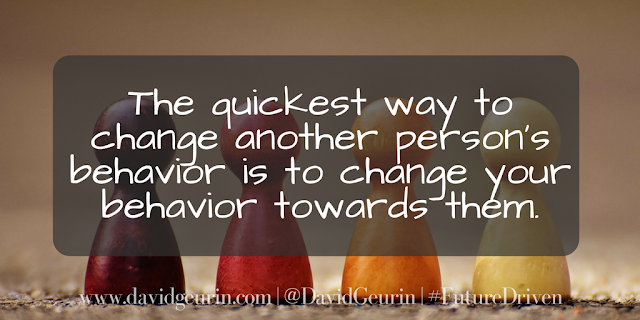 How can you show delight in them and keep the classroom energy positive and productive? I want to hear your thoughts. Leave a comment below or respond on Facebook or Twitter. I am principal and lead learner at Bolivar High School in Bolivar, Missouri. We are passionate about creating the best learning environment possible for our 800 students. Learn more about me here. Why Do Some Educators Burn Out While Others Seem to Grow More Passionate? The views expressed in this publication are solely my own and do not reflect the views of any organization with which I am affiliated. Copyright 2014 by David Geurin. Simple theme. Powered by Blogger.